We’re getting down with the five most popular songs in the Billboard Hot 100 Pop Singles chart, for the week ending July 18, 2015. The Live Aid concerts happened 30 years ago this week, and none of this week’s featured artists were alive at the time. This makes me feel old…that is all. Let’s open in fifth place, where 25-year-old Fetty Wap backs off a slot with “Trap Queen.” How did this New Jersey rapper get his career off the ground? Fetty – real name Willie Maxwell – started thinking about pursuing music after his son was born four years ago. He began selling mixtapes in 2012, and here he is today, breaking big on the charts. Taylor Swift, 25, and Kendrick Lama, 28, retreat two slots to fourth place with “Bad Blood.” Kendrick will appear on one of the year’s most-anticipated hip hop albums… the upcoming soundtrack for the NWA movie Straight Outta Compton. Other guest stars include Eminem and Dr. Dre…the movie releases on August 14. Silento is your new addition, as “Watch Me” jumps four notches to third place. 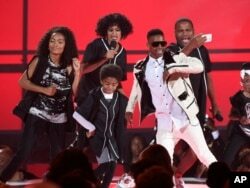 The young Atlanta rapper has vaulted to fame on the strength of its video, which features his “Nae Nae” dance…it’s racked up nearly 100 million views across fan and celebrity-generated video platforms. OMI’s “Cheerleader” has gone number one internationally, and it creeps one slot closer on the Hot 100, hitting second place. OMI is from Jamaica, but the hugely popular video was shot in Haulover Beach, Florida, near Miami. Is 13 weeks within their reach? Join us in seven days to find out!